The Flag of Distress is an American silent movie released on 20 january 1912 (in USA), produced by Imp Films Co. Black & White. 600 feet. "Another comedy, in which Sherlocko makes his first appearance. Keep your eye on Sherlocko. He's hot stuff!" - Imp Films Co. THE FLAG OF DISTRESS (Jan. 20). — Reuben Wilson has an appointment with a couple of friends, who are awaiting him outside his house. 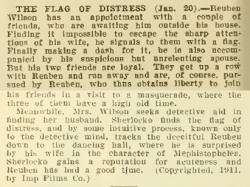 Finding it impossible to escape the sharp attentions of his wife, he signals to them with a flag. Finally making a dash for it, he is also accompanied by his suspicious but unrelenting spouse. But his two friends are loyal. They get up a row with Reuben and run away and are, of course, pursued by Reuben, who thus obtains liberty to join his friends in a visit to a masquerade, where the three of them have a high old time. The Saturday Imp comedies have acquired widespread popularity for their humorous subjects and acting. J. W. Cumpson, whose fame as a moving picture comedian is so widespread, appears in them and has already made millions of friends for himself. In "The Flag of Distress" Cumpson gets a chance of which he takes the fullest advantage. "The Flag" is an emblem by which he conveys to his friends the desired information that his wife has him under such strict surveillance that he cannot accompany them to a masked ball. However, he contrives by a clever stratagem to elude the lady's vigilance, and he and his friends make their way to the masquerade, where they have a specially good time. 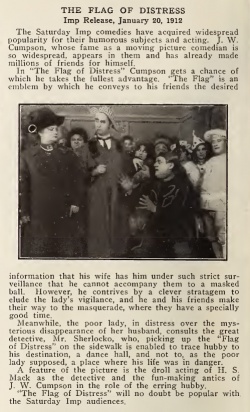 Meanwhile, the poor lady, in distress over the mysterious disappearance of her husband, consults the great detective, Mr. Sherlocko, who, picking up the "Flag of Distress" on the sidewalk is enabled to trace hubby to his destination, a dance hall, and not to, as the poor lady supposed, a place where his life was in danger. 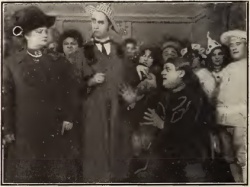 A feature of the picture is the droll acting of H. S. Mack as the detective and the fun-making antics of J. W. Cumpson in the role of the erring hubby. 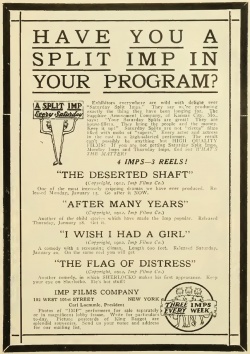 "The Flag of Distress" will no doubt be popular with, the Saturday Imp audiences.